While trying to find a way to use up some leftover buttermilk, I created this Buttermilk Banana Bread. 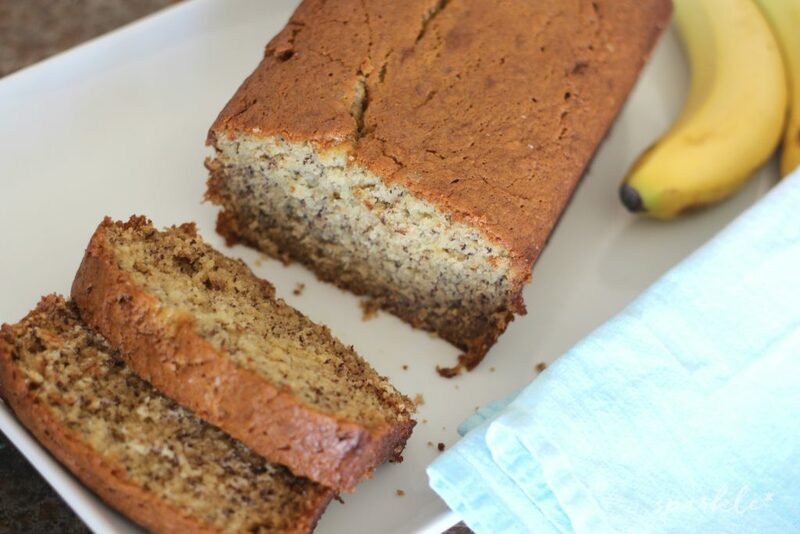 It is delicious and moist and quite possibly the best banana bread I have ever tasted! I was in the waiting room at employee health yesterday, waiting for clearance to return to work after maternity leave, and I read an article in an old National Geographic about ugly produce and food waste, which you can read here. I personally want to see more ugly produce being used. I absolutely love the carrots that resemble legs! After reading the statistics about how much food is wasted across this country, I got to thinking about my family’s food waste. It’s pretty sad, really. 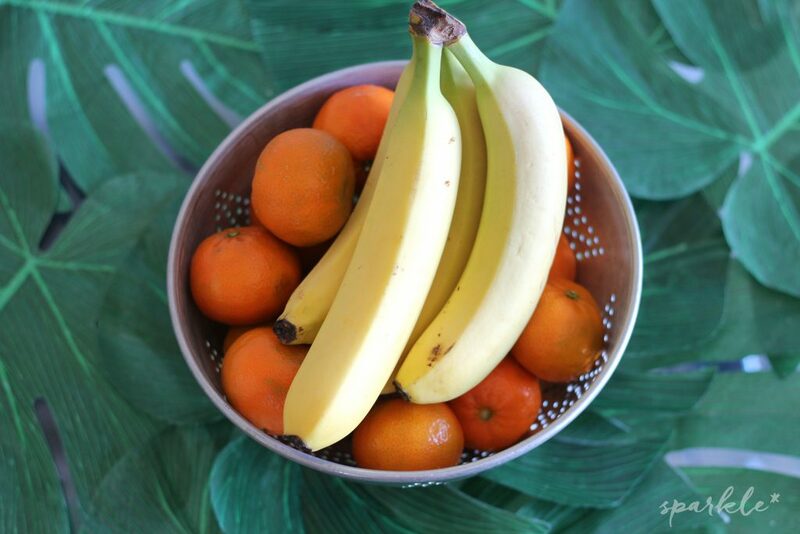 Cookies and treats never get thrown out, just the healthy stuff. It also got me thinking about random ingredients that I buy that don’t get used up. Looking in my fridge I found a nearly full container of buttermilk. I used some of it in this buttermilk chocolate layer cake. I could have used it to make salad dressing, which I do sometimes, but I had some also bananas that needed to be used up. Boom, I avoided wasting two foods with one recipe! Buttermilk banana bread! Of course you can always peel and freeze your ripe bananas if you can’t use them right away. Frozen bananas are a great addition to protein shakes. The girls love it when I make banana bread because they get to help by mashing up the bananas and because since the recipe comes together so quickly, I use a hand mixer instead of the stand mixer, and the girls get to lick the beaters. Licking the beaters one of the best parts of baking, errr, I mean childhood. 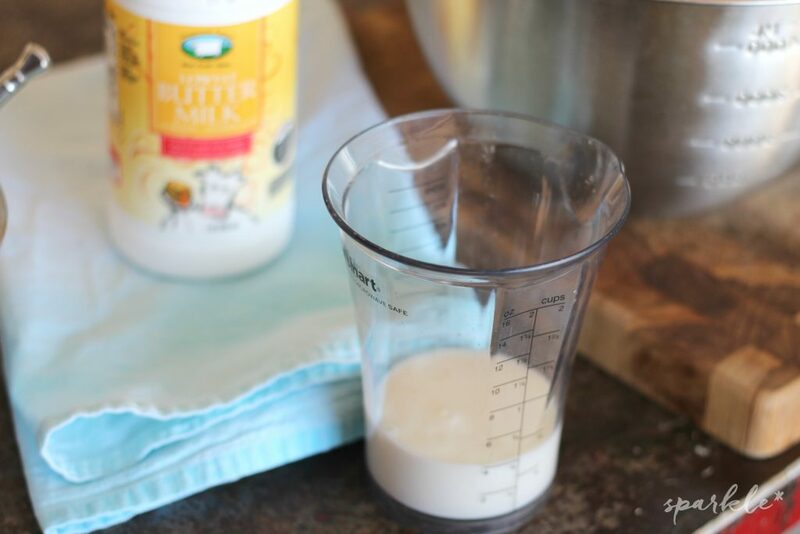 The buttermilk keeps the banana bread nice and moist and an extra splash of vanilla extract adds a fantastic flavor. Once all prepared, the batter bakes in a greased 9×5 loaf pan for an hour and 15 minutes… low and slow. It is definitely worth the wait! Cream together softened butter and sugar with a mixer. Add eggs, one at a time, then add the buttermilk. Mix in the mashed bananas and vanilla. Place batter in a greased loaf pan and bake at 300 degrees for 1 hour and 15 minutes. 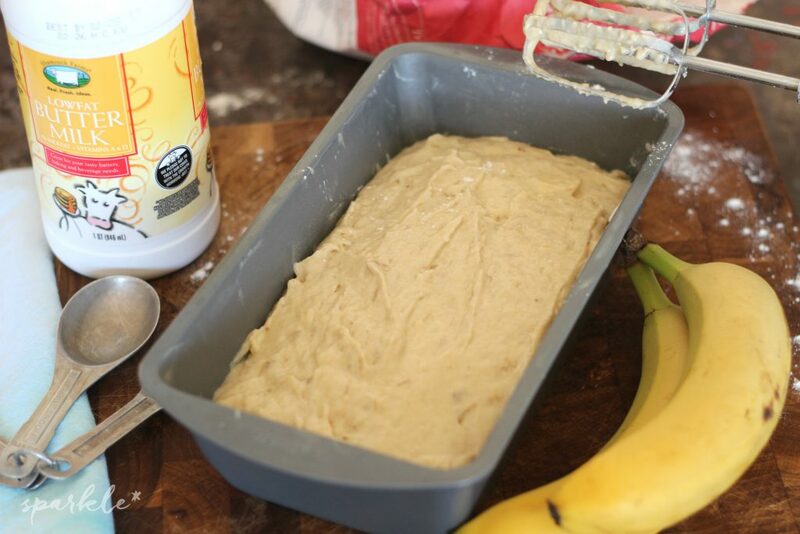 When i was younger i had a friend who i loved to go round to her house as her mum always had this fabulous banana bread, i had actually forgotten all about it until reading this today, maybe i will give it a go and see if i can get it as good as she did. thanks. 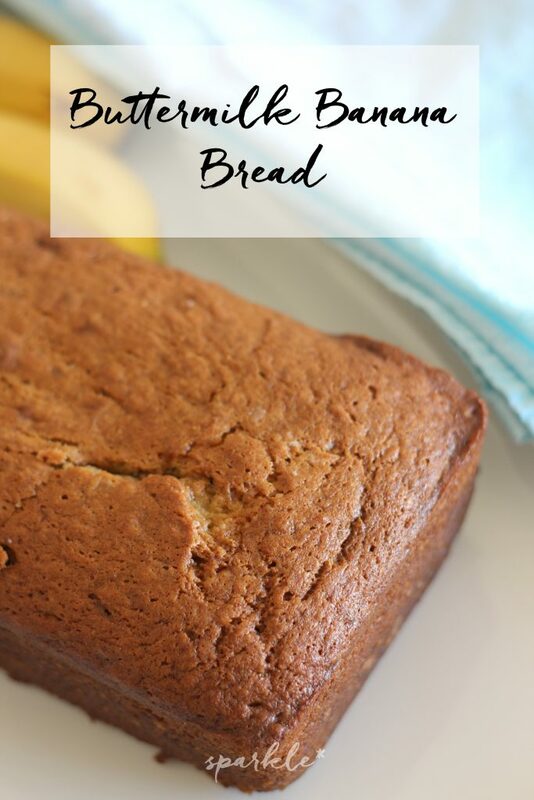 I love banana bread and a great idea to add the buttermilk. 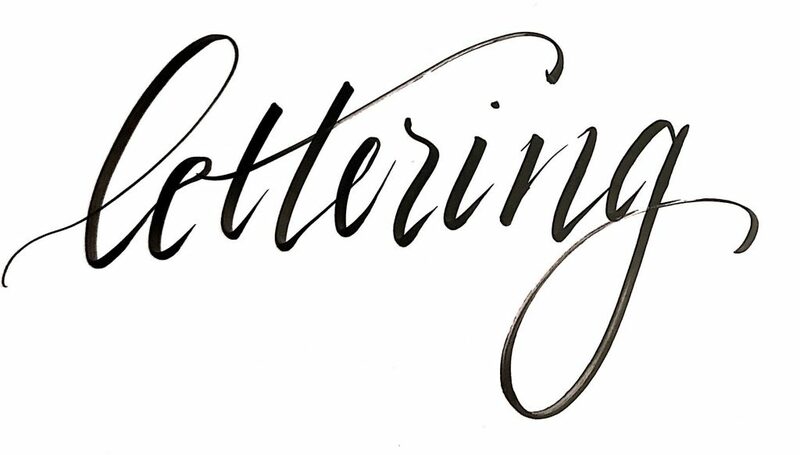 It goes well in lots of things I find. Thank your for bringing this to Fiesta Friday. Banana bread is one of my favorites. 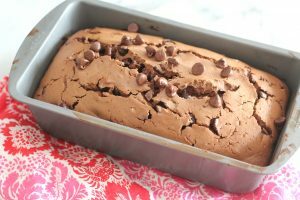 I love banana bread and have never used buttermilk and I’m sure it tastes superb! Thanks for sharing with us at Funtastic Friday! I haven’t had banana bread in a long time. This looks so good and I love the use of buttermilk. Thanks for sharing at Fiesta Friday party. 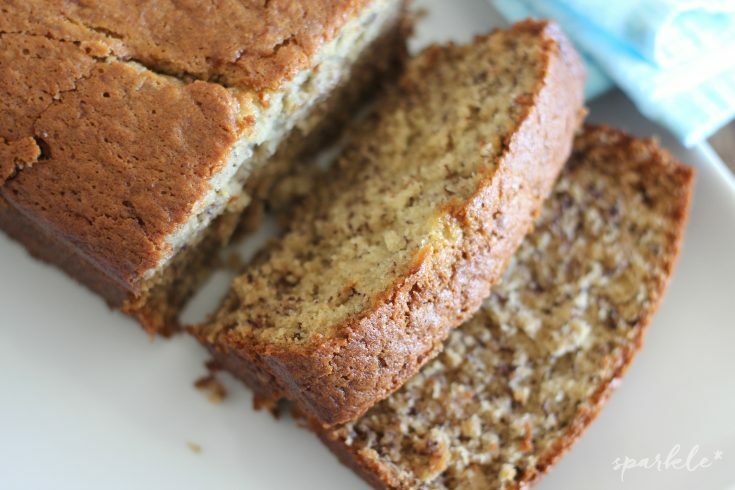 I just pinned your delicious Buttermilk Banana Bread and can’t wait to try it! Thanks so much for sharing your awesome recipe with us at Full Plate Thursday. 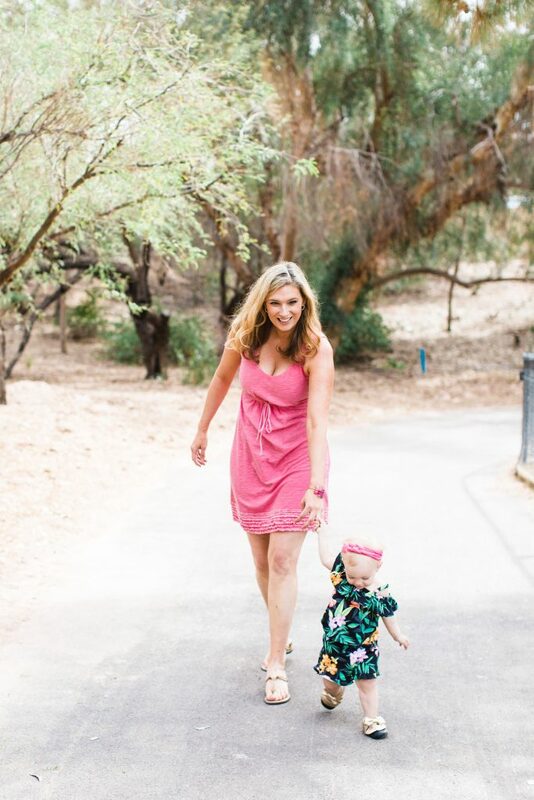 Hope you are having a great week and come back to see us real soon!